A beautifully furnished, modern apartment in a fantastic location! 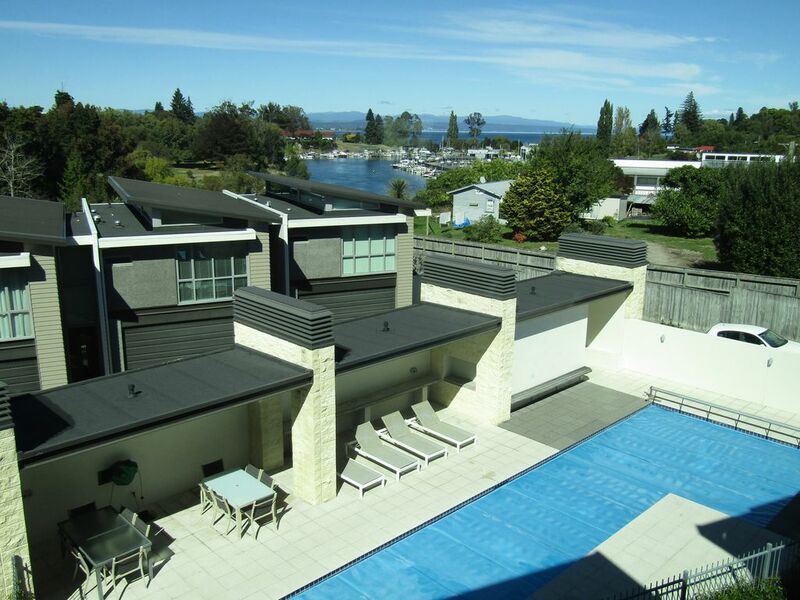 It is part of a gated complex very close to town and has a single garage so you can leave the car behind and walk into town making it very handy for all the great events Taupo has to offer. This 3 bedroom property sleeps 6 people and has a portacot you are welcome to use. The complex is well situated only a few minutes walk to shops restaurants and bars and the boat harbour is only a minute away. The complex has a well fenced communal heated pool and BBQ area. All in all a great place for a get away weekend with friends! Linen is bring your own, or you can hire it for $15 per person, please ask for this service upon booking. This complex is riverside and has a pool so please keep an eye on children. Swimming in this part of the river is not advised due to strong currents. *Heated pool available at the complex, heated over summer months only, children must be monitored at all times. Awesome location, and great for what we needed. Plenty of exercise with the stairs. Lovely apartment, really enjoyed the detail in every room. Had everything we needed and close to town.